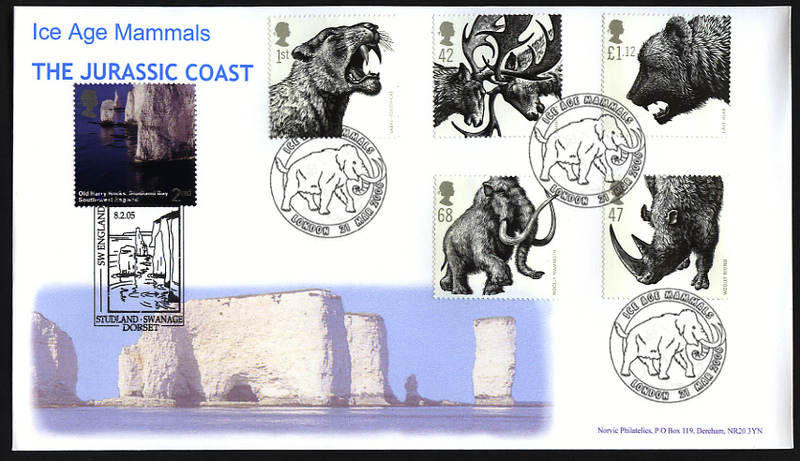 Ice Age Animals - Great Britain stamps - 21 March 2006 - from Norvic Philatelics. 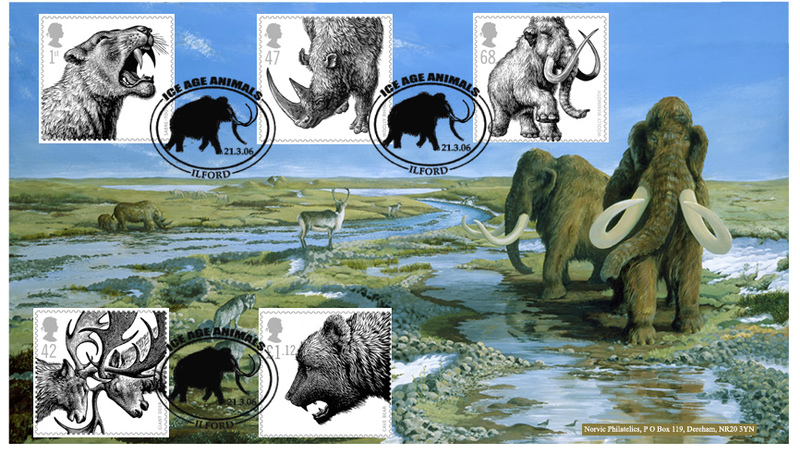 Royal Mail continues the animals theme with a set of 5 striking images of creatures from the ice age which began around 2 million years ago. The set features the giant deer, sabre tooth cat, woolly rhino, cave bear, and woolly mammoth, all of which once roamed the United Kingdom. 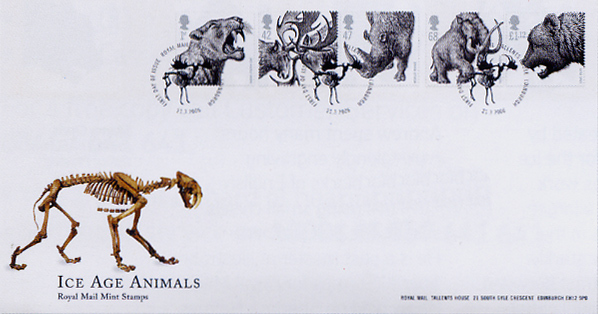 There were many different species of sabre-tooth cat around the world; all are now extinct. The last European species, Homotherium, died out about 400,000 years ago. Although overall about the size of a lion, it had a long neck and relatively long front legs, which together with muscular forequarters made the animal look more like a hyena than a cat. It pursued prey such as horses and young mammoths, and used the long canine teeth - strongly flattened and quite fragile - to press into captured prey rather than to capture or stab at them. Giant deer had the largest antlers of any known deer, living or extinct. They grew in size and complexity through the animal's youth, typically reaching a span of 2.5-3.5 metres in large stags. Shed each year in the spring, they were grown through the summer, and used in fighting during late autumn and winter. These huge deer reached around 1.8 m height at the shoulder and weighed around 500 kg. The giant deer lived in small herds and was not an abundant species, perhaps because growing the huge antlers restricted it to areas of mineral-rich vegetation. The last ones died out only 7,000 years ago in western Siberia. DNA extracted from frozen carcasses has shown that the woolly rhino was most closely related to the living Sumatran rhinoceros. It had a body weight of about 2 tons, a massive shoulder with a height of about 1.8 metres, and a thick mane. The extraordinary front horn was typically 1.2m long, and very flattened. Close examination reveals that the front edge had a 'keel', suggesting active side-to-side movements of the head, perhaps for snow-clearing. Like living rhinos, the woolly rhino was probably solitary or lived in small groups. Contrary to popular belief, the woolly mammoth was no larger than living elephants, but with a domed head, sloping back, thick, hairy coat and enormous spirally curved tusks. It also had tiny ears and a very short tail - probably to minimise heat loss or frostbite. Stomach remains preserved in some Siberian carcasses show that the diet was 90% grass, plus mosses, ferns, and some shrub browse. Living in an open habitat, it is likely that herds often accumulated into hundreds or even thousands of animals, but within this smaller family structures, as in living elephants, still remained. Fossils of this extinct species have been found only in the middle and southern latitudes of the European continent. A bear of very large size - larger than the American grizzly - it was also marked out by a very pronounced 'step' shape of the forehead. Some caves in central and eastern Europe have yielded vast quantities of remains - up to 30,000 individuals in one Austrian cave alone. While most species of the bear family are omnivorous, recent biochemical analyses of fossil bones confirm that the cave bear was an exclusive vegetarian. All images except FDCs are copyright Royal Mail 2005/6. Available with any postmark shown, if ordered by 18 March. Special postmarks announced for the Day of Issue are shown here. This page updated 10 April 2006. If you have any questions regarding the stamps on this page, e-mail us.